So you have escaped the ruins of civilization and sought refuge in the wild. How our generations of comfort have left us unprepared for the wrath of nature! 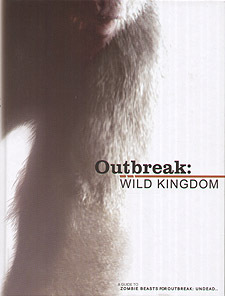 Outbreak: Wild Kingdom introduces a host of new threats, of both the undead and the untamed forces of nature. In the collapse of our insulating civilization a whole new level of fear is realized as your players try to survive against beasts, zombies and elemental forces. A detailed sample campaign "The Fair King Zoo"